ROME, Italy -- The Food and Agriculture Organization (FAO), working with the European Union has completed the deployment of 25 Fish-Aggregating Devices (FADs) � or 'fish magnets' � along Somalia's 3,300 km coastline, aiming to boost the nation's small-scale artisanal fisheries and tackle food insecurity and malnutrition to some extents by sustainable usage of the devices. In a statement issued today, FAO explained that the devices consist of a floating buoy and so-called 'habitat mat' a few metres across. "Plant life quickly grows under the mat, attracting large numbers of fish � in essence crating new high � density fishing grounds where none existed before," the statement said. These 'fish magnets' will attract many different fish species, including tuna, that normally small � scale fishers cannot easily catch, making fishing more safe and efficient, while also encouraging fishers to switch their fishing efforts away from habitats such as coral reefs and sea grasses that are vulnerable to overfishing. "The FADs initiative is at the heart of the work by FAO and our partners to boost coastal livelihoods, strengthen resilience, and tackle the underlying causes of piracy � illegal fishing, degradation of local fisheries, high levels of youth unemployment, and food insecurity," said FAO representative in Somalia, Richard Trenchard. The effort has been funded by the governments of Japan and Switzerland, while the European Union Naval Forces (EUNAVFOR) � which has a regional role in combatting piracy and monitoring fisheries � has provided critical protection and logistical support for the vessel that deployed the FADs. According to FAO, the European Union Head of Delegation and Ambassador to Somalia, Michele Cervone d'Urso, commended the programme as a crucial addition to efforts aimed at creating employment in Somalia's piracy-affected areas. "This is an integrated approach to creating long-term, sustainable employment opportunities to youth and women as alternatives to piracy and migration, by developing the value chains of the fishery and livestock sector within the coastal communities of Puntland, Galmudug and Banadir where traditionally communities have combined seasonal fishing and pastoral activities," said Mr. d'Urso. FAO has worked with 20 communities as well as federal and regional ministries in Somalia to identify the deployment locations and ensure that the FADs would be accepted and well used. "Just over one million people in Somalia currently face severe food insecurity, while an estimated 307,800 children under the age of five are acutely malnourished," FAO noted, pointing to sustainable fisheries as a key element of tackling food insecurity in the country. In addition, Mr. Trenchard explained that the devices should help kick-start further longer-term development support to these communities, most importantly, investment to strengthen market linkages. "As well as expanding the FADs programme to other areas," he said, "we will be working with the ministries and the fishing communities to attract further investment for ice machines, cold storage and processing facilities, improved landing sites and, of course, better roads to bring fresh fish to markets as quickly as possible." Related FAO activities in Somalia include boat building, fish preservation training, distribution of solar fridges, construction of jetties and the registration of fishers, much of which has been supported by generous funding from Norway and the United Kingdom. Additionally, with European Union funding. FAO plans to launch a broader programme to stimulate further growth across the fisheries sector and further reduce the chances of piracy re-emerging in the future. While FADs can have negative environmental impacts when used unwisely, FAO has been at the forefront of developing guidelines for their sustainable use, building on lessons learned elsewhere. 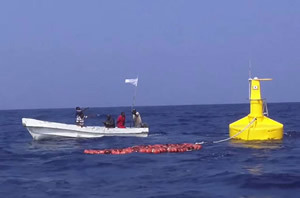 In Somalia, the FAO devices have been deployed in carefully targeted deep-water locations and are anchored to the seabed. Further, FAO has been actively engaging with women, youth and fishers, as well as relevant authorities to develop local management best practices and agreed rules that will reduce the chance of local conflict and ensure sustainable use of each FAD. These rules are enshrined in local agreements, signed by village elders, co-op leaders as well as government ministries.